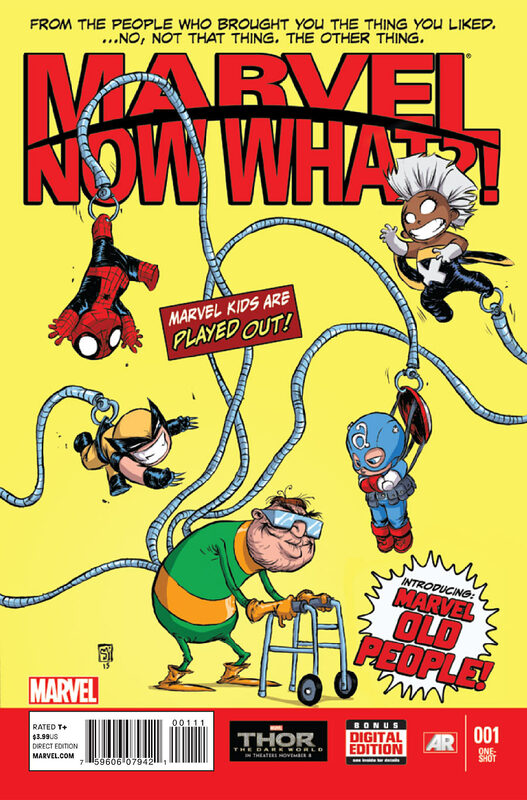 I do like it when a person or company can make fun of themselves… and that is exactly what Marvel Now What?! is all about. I mean, this book really has everything. They make fun of their own characters like having a story about how Captain America is not adjusting well to the modern world, and in turn take a jab at Catfishing (the internet kind, not to be confused with Noodling). There is even a What If story that examines a popular fan-AU pairing: Thor and Storm. I’m pretty sure this is a direct response to DC putting together Wonder Woman and Superman in their reboot. And, of course, it makes fun of its own policies, such as the endless crossovers and just throwing everything and the kitchen sink into the mix in hopes of boosting sales. Could it have been even more satirical, certainly, there were some pulled punches, but overall, it was a rather fun read that just makes you chuckle and laugh, which considering that most of the Marvel writers don’t consider writing anything less than ‘let’s be as depressive and homicidal as possible’ as their main plot devices, makes this story is a nice change of pace.